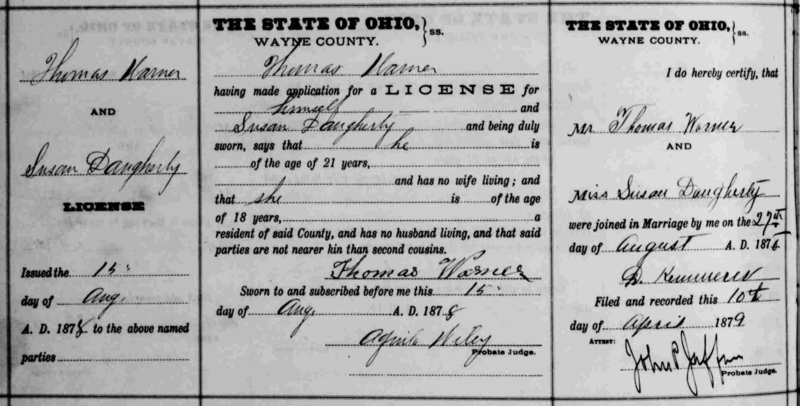 Warner & Henninger Marriage (1840)Thomas D Warner was born on 19 Jun 18141 in Sunbury, Northumberland, Pennsylvania.2 Even though there were multiple Warner families from Northumberland County, we have no record of who his parents and siblings were. (Birth date was obtained by counting backwards using information provided by the headstone at his gravesite). Thomas' childhood is a complete mystery, as is his entire life in Northumberland County, Pennsylvania. As a matter of fact, the first records that have been uncovered for Thomas appear after his migration to Wayne County. 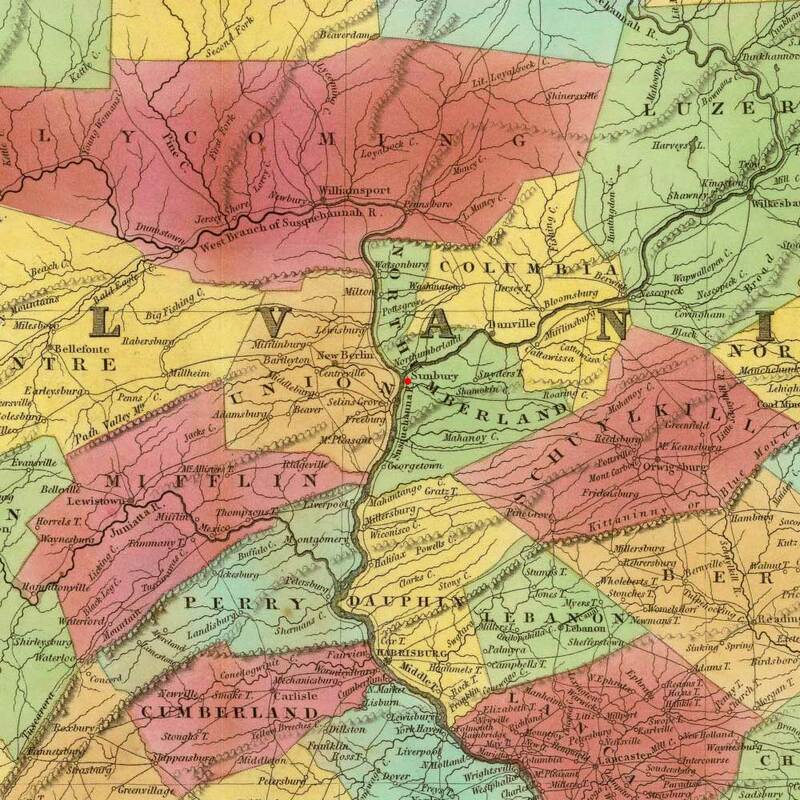 We have specifics of a Peter Warner that had moved to Congress Township in Wayne County as early as 1815, but we have no proof of a connection to Thomas. 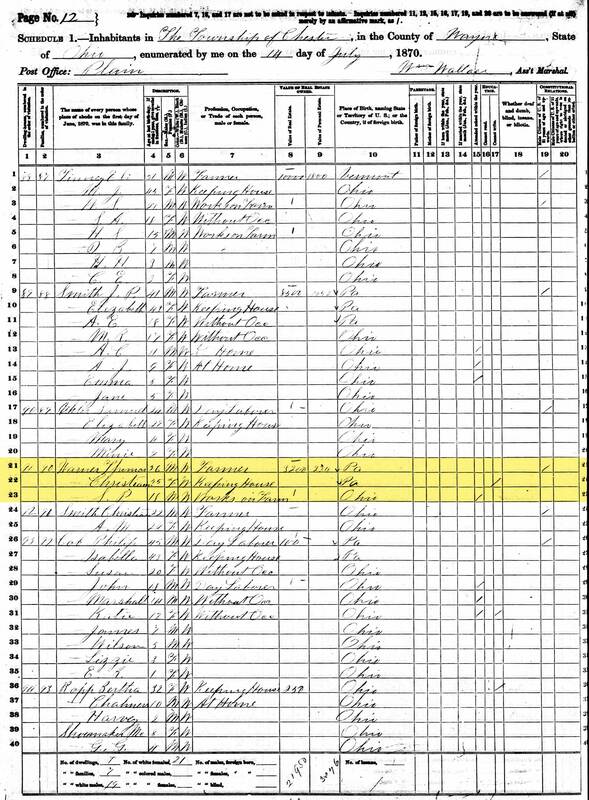 1850 Census for Warner FamilyOur first record of Thomas Warner is for his marriage to Christina Henninger on 13 Feb 1840 in Wayne County, Ohio.5 Christina was a fellow transplant from Northumberland, Pennsylvania. Her family was from Augustaville, a small town next to Sunbury, and may have had a prior relationship with Thomas before relocation to Ohio. In 1848 Thomas had purchased a house and farm land of his own where he worked as a farmer in Chester Township, Wayne, Ohio with his wife Christina. 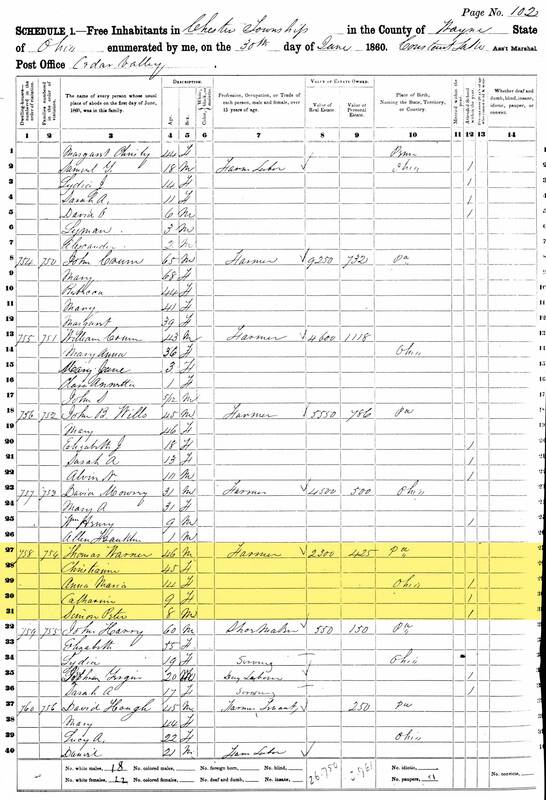 Here he raised his daughters Anna Maria, who was born in 1846 & Catharine, born 1851, and son Simon Peter, born 1852.7 In 1861, Thomas purchased his first piece of land in Cedar Valley, just north of where the family had been living in Chester Township. Thomas would remarry in 1878 to a local widow named Susan Daugherty. Susan caused quite a rift in the family. Especially with son Simon Peter. 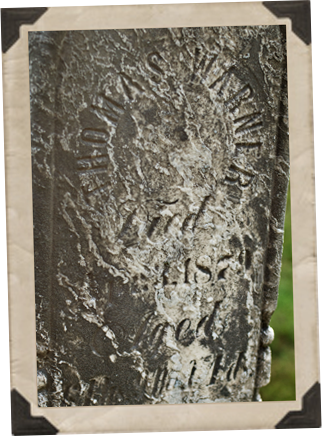 Thomas died on 03 Apr 1879 in Chester, Wayne, Ohio.1,B Thomas rests with his wife Christina at Overton Cemetery. At some point, the Warner family home in Chester Township was inherited by son-in-law John Wesley Winkler through his daughter Catharine Warner. Thomas' other property just north of the home appears to have been sold in the years leading up to his death. Note: "Charles J. Warner, M. D., was born in Wayne township, Wayne county, Ohio, Jan. 1, 1836. His father, Peter Warner, was a farmer and a native of Sunbury, Northumberland county, Pa., with whom the subject of this sketch remained until he was eighteen years of age. The farm life, we are quite ready to believe, harmonized with the developing manhood of Dr. Warner, and enables us to describe him as a splendid specimen of physical and muscular outline. While thus engaged, he utilized every opportunity and employed his leisure hours in study and in the perusal of such books as he could make accessible, and which would most benefit him in establishing a foundation for future acquisitions and fields of usefulness." 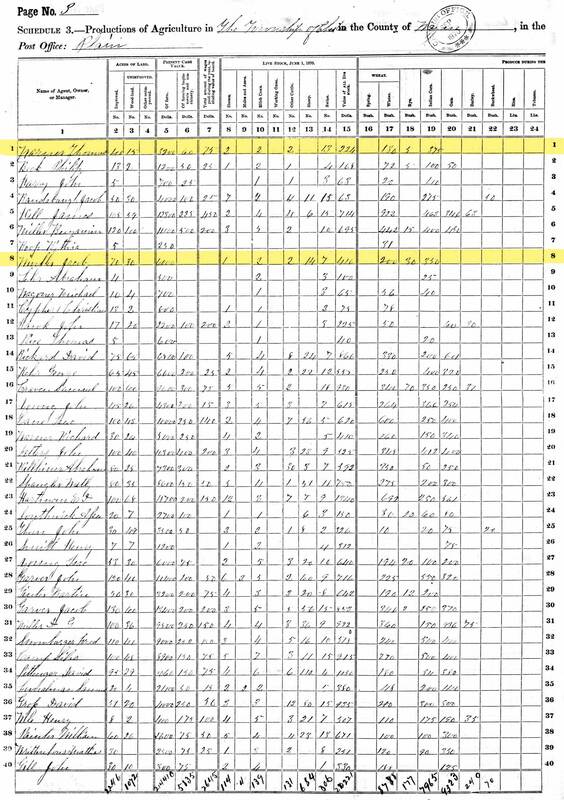 --- quoted from http://www.ohiogenealogyexpress.com/wayne/wayneco_hist_1878/wayneco_hist_1878_congress.htm --- this same page lists that a Peter Warner and his family moved to the SW corner of Congress Twp in Apr 1815. Susan Cayhoe, 1827 - ? 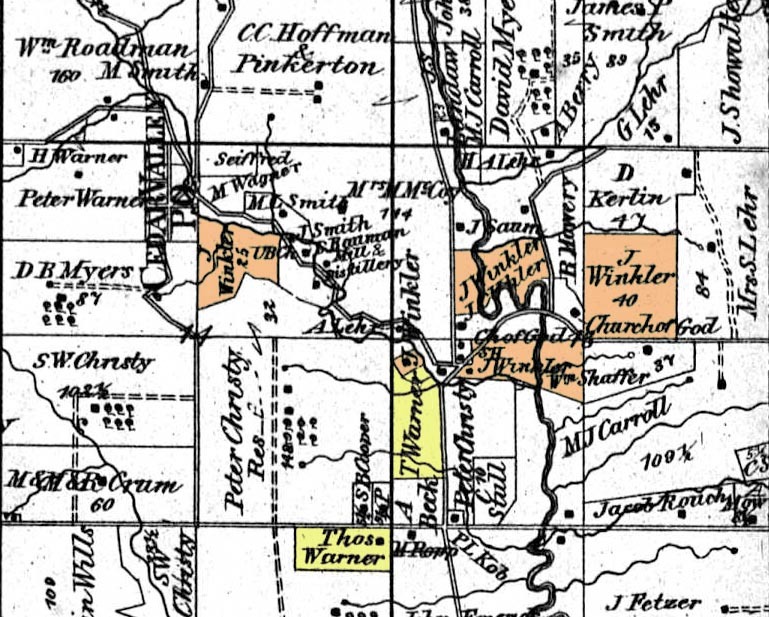 A Thomas Warner was one of many Warners from the Northumberland area living in Wayne County, Ohio. 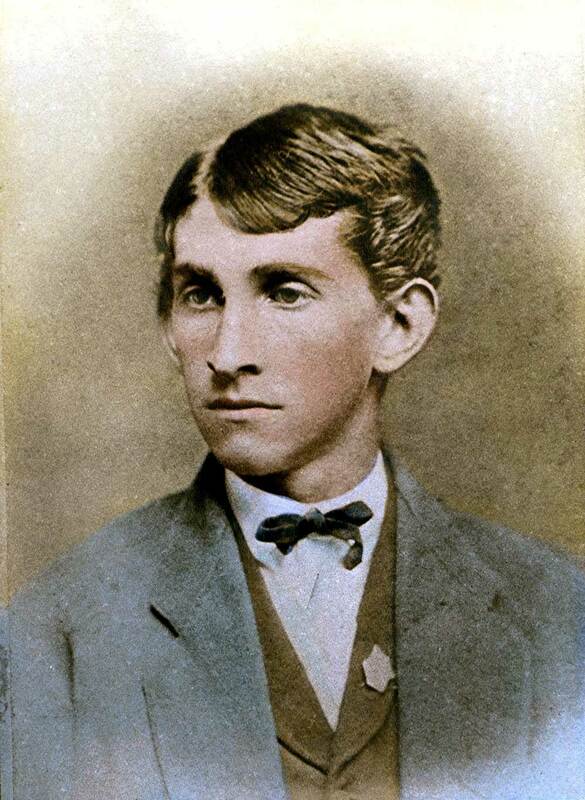 It has been mentioned that he is most likely the sibling of Peter (1807-1877; married Ann) and possibly Jacob I. Warner (both of Wayne County) and that it might be mentioned in the Warner Reunion book held at the Wayne County Library, however I was unable to find any reference in the reunion book. B Originally, I had noted burial records stated Thomas wasn't buried at the Overton Church Cemetery until 19 Feb 1889, 10 years after his death. Currently, I cannot find the record that originally caused me to note this as it was very early in my research and was not properly documented, apparently. I have yet to discover the reason for this massive gap in the records, however, if the gap is accurate, it's likely related to the rift between the family and 2nd wife Susan. I suspect Susan may not have buried Thomas in Overton with his first wife Christina. C Just speculation at the moment to deepen the rift, but this could also be related to the delay in Thomas' burial if Susan had Thomas buried elsewhere and not next to his first wife/mother of his children (if there was a 10 year delay). About 2nd wife Susan: Susan Cayhoe/Kaho was born in Pennsylvania about 1827. She first married David Daugherty, then Thomas Warner and after Thomas' passing she married John Snyder. 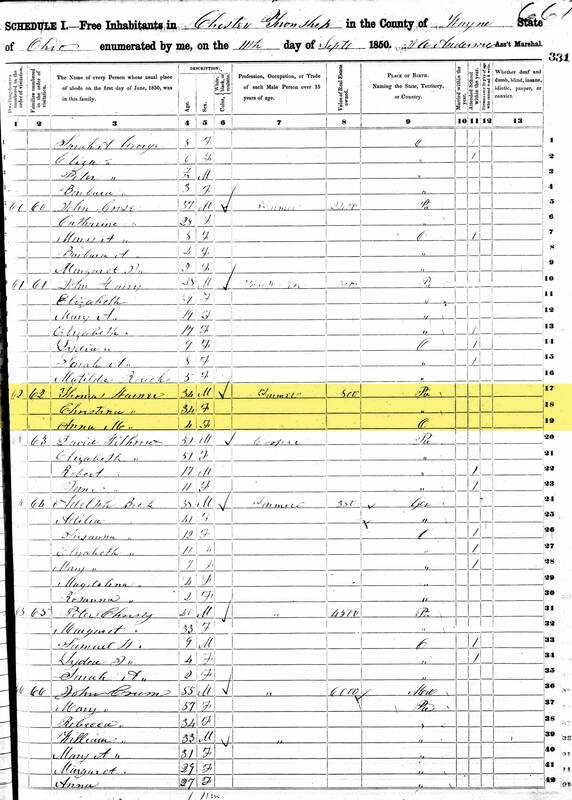 You can find Susan and an unknown Ida Warner (age 6) with John Snyder in Marboro, Stark, OH in 1880.
Who were Thomas Warner's parents? Was Peter Warner really his brother or just a close cousin? Peter Warner arrived in Ohio and settled in the SW corner of Congress Township in April 1815; Was the same true for Thomas? Was 2nd wife Susan the reason Thomas wasn't buried in Overton for 10 years? / Was there really a 10 year delay in Thomas' burial? Since they were from neighboring towns, did Thomas and Christina know each other prior to moving to Ohio? Did Thomas and Christina's families migrate to Ohio together? 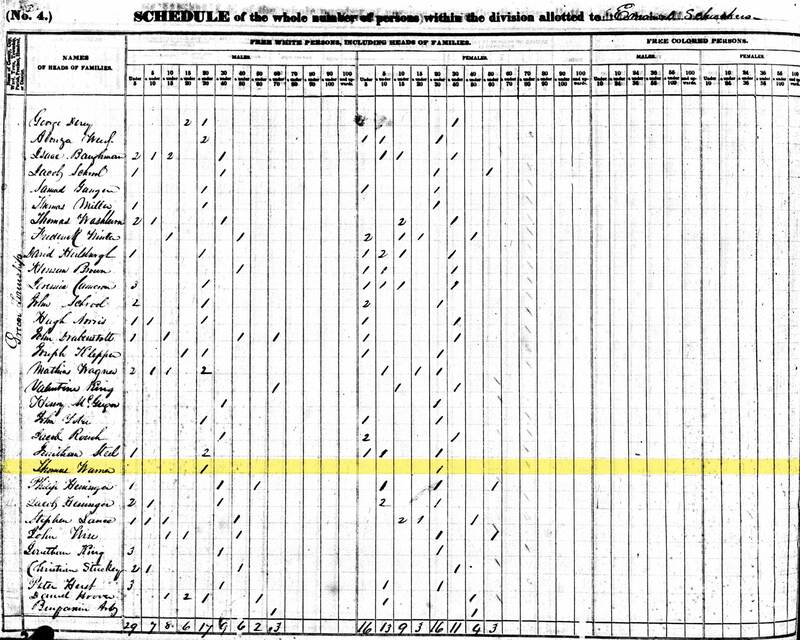 + 1860 United States Federal Census about Thomas Warner; "United States Census, 1860," database with images, FamilySearch (https://familysearch.org/ark:/61903/3:1:33SQ-GBSF-F72?cc=1473181&wc=QZ2Z... : 8 April 2016), Ohio > Wayne > image 3 of 50; from "1860 U.S. Federal Census - Population," database, Fold3.com (http://www.fold3.com : n.d.); citing NARA microfilm publication M653 (Washington, D.C.: National Archives and Records Administration, n.d.). 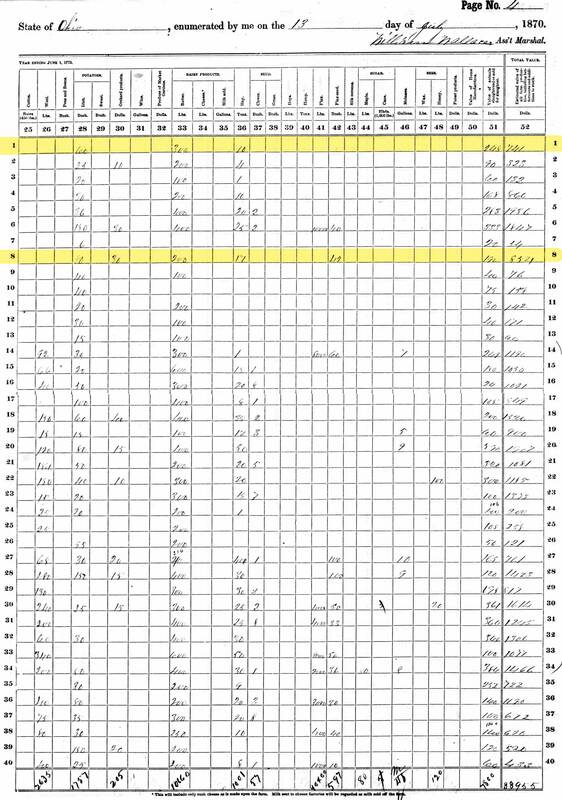 + Marriage of Thomas Warner and Susan Daugherty (1878), "Ohio, County Marriages, 1789-2013," database with images, FamilySearch (https://familysearch.org/ark:/61903/1:1:X8R2-R13 : 8 December 2014), Thomas Warner and Susan Daugherty, 27 Aug 1878; citing Wayne, Ohio, United States, reference 152; county courthouses, Ohio; FHL microfilm 425,757.